New Year's Eve Event- Welcome the New Year 2013 with the Lord through midnight mass and Adoration. 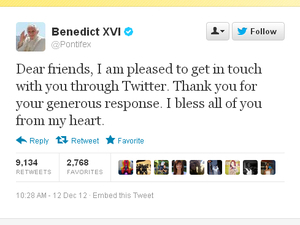 Pope Benedict XVI sends his first tweet!! and a lot more..
Pray Your Way Into 2013! "We believe in One Church of Christ" fourth series of 10 talks for the Year of faith on 15th January 2013 by Rev Dr Gareth Leyshon. The National Service Team of the Catholic Charismatic Renewal now have a new website..
You can visit http://www.ccrw.org.uk/ for more information and their latest events. Pope Benedict XVI send his first tweet:- Pope Benedict XVI knows the importance of social media in this day and age so the 85-year-old sent his first message, by the end of the afternoon, he had 800,000 followers, he used a tablet computer to send his first personal Twitter message. In response to the invitation of the Holy Father Benedict XVI to the movements for Pentecost vigil in 2013, ICCRS is happy to announce that a programme has been planned around the meeting with the Pope. All those in the Catholic Charismatic Renewal who will come to Rome for the official event, from all over the world, are invited to take part in this meeting. Friday evening, 18th May: Prayer meeting in a central Church in Rome. Saturday, 19th May: Pentecost Vigil with the Holy Father. Sunday afternoon, 20th May: Pentecost of the Nations Celebration. We had a few price quotes from two tour operators for a group min of 20 people for travel to Rome from 17th May 2012 to 21st May 2012..Here is a rough estimate of the quotes we received..
Price Quote 1: £539 per person including flight, hotel, morning and evening meal. Both companies require a deposit of £175 atleast 10 weeks before departure.. The last date for booking entry is 1st March 2013. A minimum group of 15 person is required for a group trip to from Cardiff. Pls let us know your preferences so we can provide feedback to the tour operators. Those interested in being independent and not going on a group tours. Your details will then be passed on to the Chair of the Cardiff Diocesan Service Team- Mary Fodor and the Chair of National Service Team Frances Graham..Pls also write to the above email on how to pay your deposits for travel. Those who are interested in receiving the monthly newsletter please write to subscribe and contact our newsletter team. Please tweet or facebook our webpage to your friends!! Wherever you live in (or near) the Archdiocese, and whatever your preferred kind of event, there will be something for you this Advent and Christmas season.